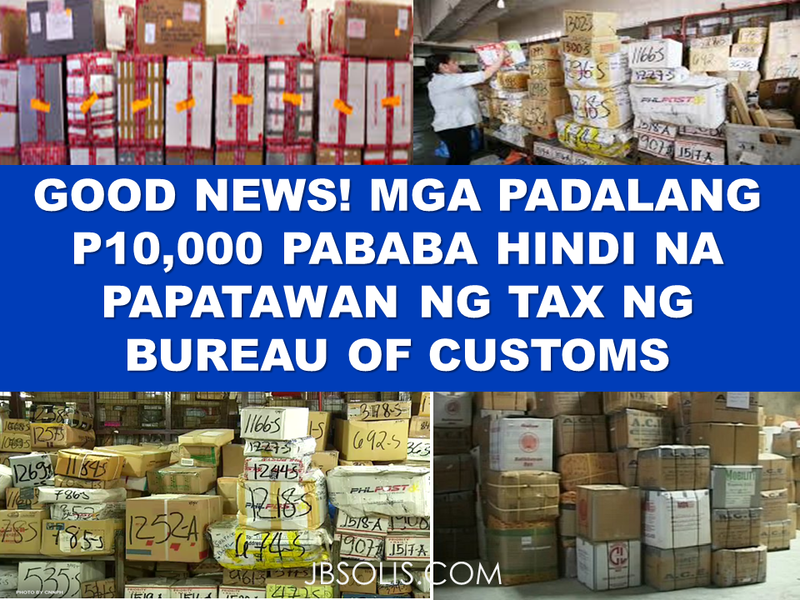 The new Customs Modernization and Tariff Act states that all parcels amounting to P10,000 and below will be exempted from paying any taxes and duties.According to Customs Commissioner Faeldon,it is a good gift for the OFWs for the coming Christmas season. The Bureau of customs will soon fix the tax exemption for the balikbayan boxes amounting to P150,000 and below.A law concerning this is expected to come into effect any from now. The former Deputy Commissioner of the Bureau of Customs, Atty. Agaton Teodoro, said that they will implement the tax exemption soon as Congress is already on the final reading of the proposed Customs Modernization and Tariff Act. The Congress approved the bill while the senate, is on its third and final reading prior to approval. He also expressed in this interview that they are not opening Balikbayan boxes anymore, canine dogs and XRay machines are used to inspect the OFW and expats boxes. Why P10,000? Where are those proposals of our good Congressmen and Senators like P80,000 or P100,000? 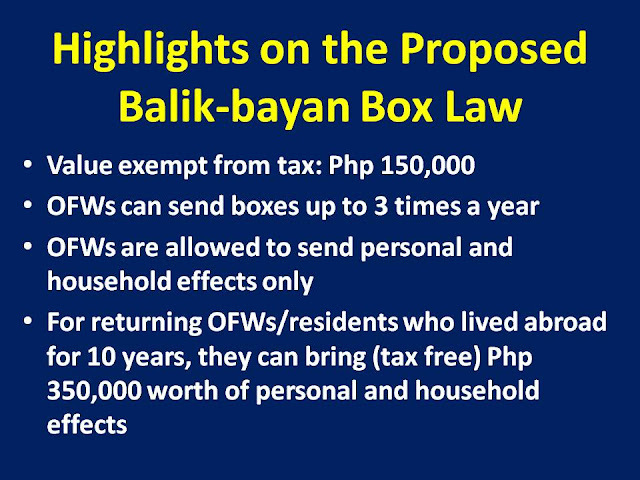 Sen. Ralph Recto has issued a press release that his proposed Balik-bayan Box Law will be submitted to the senate for approval today. Regardless of the total dutiable value of its contents, Senate Bill No. 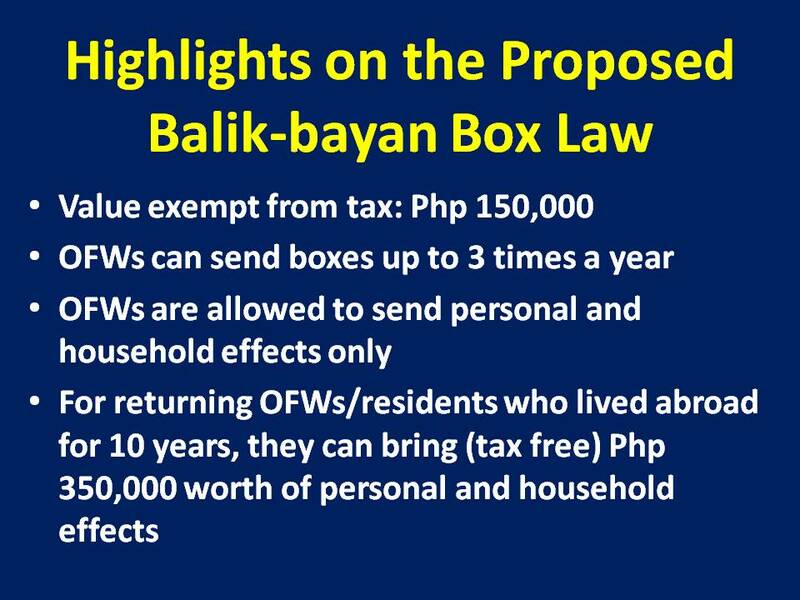 2927 also seeks to exempt from taxes and duties one balikbayan box per month per OFW which Pimentel said "is but a small measure of assistance in view of the tireless efforts of our OFWs, who work selflessly abroad and endure long separation and loneliness from their loved ones."